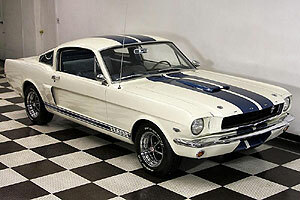 1966 FORD MUSTANG GT350, IM NOT A MUSTANG FAN, BUT THIS IS A REALLY NICE CAR. THIS IS BASICALLY BRAND NEW CAR FROM TOP TO BOTTOM. CHECK OUT THE UNDERCARIAGE PICS. GORGEOUS GT350 CLONE WITH A 4-SPEED. 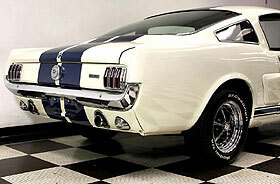 This car has a huge amount of restoration quality as you can see by the pictures. In the last years since he bought it he has driven it very little. The car started out a rust free car and was transformed to what you see today. The complete drive train was completely rebuilt from front to back including the 289ci engine the four speed transmission the axels and the rear end. New belts, new hoses, new wiring. New carb. The car is a very nice car and the underside looks amazing. The interior looks very nice and it has new seat covers, new carpet,new headliner, new GT350 floor mats and many other new parts. It runs very hard and very strong and the four speeds shifts nice. 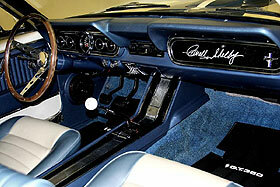 The glove box was signed by Carroll Shelby and the front seat belts are Shelby style seat belts. The exterior paint is very nice.